If you're looking for an unusual dwarf shrimp with stunning colors that's still pretty easy to keep and breed, you're on the right page. 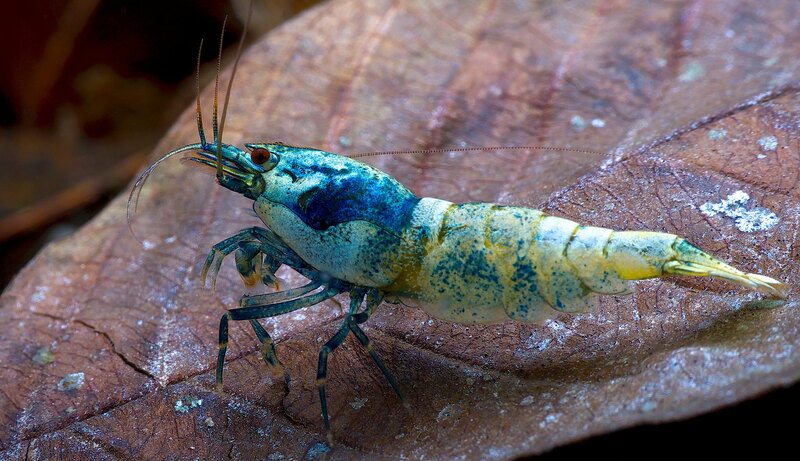 Blue bolt shrimp are a type of Taiwan bee with a white and blue body. Their beautiful color and effectiveness as a cleaning crew are sure to make these Caridinas the centerpiece of any tank. Keep reading for everything you need to know about blue bolt shrimp care and keeping blue bolt shrimp in your own aquarium! Blue bolt shrimp are a bee shrimp variety, just like the more well-known Crystal red shrimp. This means their care requirements are quite similar. General dwarf shrimp care guidelines also apply. Go for an aquarium of at least 5 gallons (19L) but keep in mind that a larger setup is easier to keep stable. If you're a beginner you might want to consider something like a 10 gallon (38L), as blue bolt shrimp aren't as sturdy as their Neocaridina cousins and can be sensitive to bad water values. Tanks this size can sustain large colonies without a problem. While you might be able to get away with an unfiltered but heavily planted tank for the less sensitive shrimp varieties, you really do need a filter if you want to keep blue bolts. A regular sponge filter works fine; if you go for something else be sure to use a prefilter sponge to prevent baby shrimp from disappearing in there. Another thing you should always have on hand is a liquid test kit to determine whether your cycle is complete and stable. Never introduce blue bolts (or any shrimp/fish for that matter) into an uncycled aquarium! Like all shrimp, blue bolts need plenty of hiding places in the aquarium to feel safe. They also like to have all kinds of surfaces to forage on. Plants like Java moss will be much appreciated and aren't difficult to grow at all. As discussed, blue bolts and other Caridina cf cantonensis varieties aren't the easiest shrimp to keep alive. They have specific demands when it comes to water values and are especially sensitive to bad water quality. Even the slightest bit of ammonia or nitrite can quickly kill them and nitrates should always be kept low as well. Test the water very regularly to make sure everything is still okay! Also do weekly water changes, but make sure the new water matches the old to prevent deadly fluctuations. Water value-wise, blue bolt shrimp like soft and slightly acidic water, though there is a bit of wiggle room. Temperatures can be anywhere between 65-85 °F. Be sure to always use a heater unless room temps are very consistent; again, fluctuations can quickly kill these sensitive shrimp. When it comes to dwarf shrimp, always be careful with tankmates, especially if you're looking to breed. Almost all fish species have an appetite for (baby) shrimp so it's a good idea to stick to just peaceful inverts. If you really want to keep the bioload low (and water quality high), just avoid all risks and go for a shrimp-only setup. This especially applies to the more expensive and rare types like blue bolts: you just don't want to lose any! Keep in mind that many bee shrimp (Caridina cf cantonensis) varieties do interbreed. Don't combine them unless you know what you're doing. 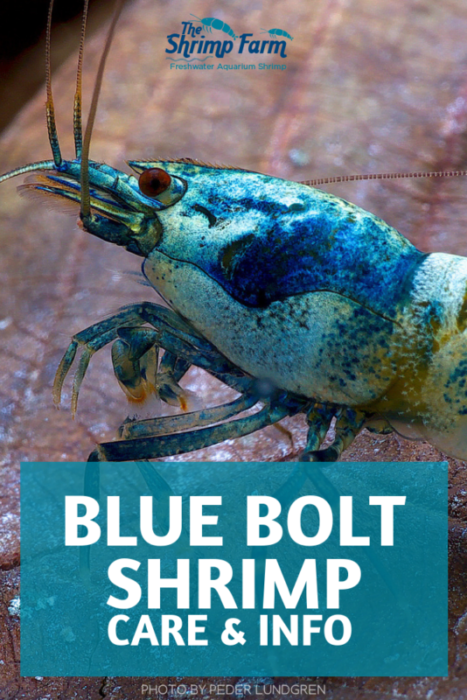 Like most shrimp, blue bolts naturally eat anything they can find. They spend much of their time picking algae and aufwuchs off every surface in the tank. Because most tanks don't contain enough nutrients for the shrimp to survive this way you should offer extra food once a day or so. Most shrimp aren't picky when it comes to food. A high quality shrimp food and regular variation in the form of blanched veggies, frozen foods and pretty much anything that's green and safe should work well. Be sure to remove any uneaten foods within a few hours, as anything decaying in the aquarium can quickly cause issues with the water values. Breeding your blue bolt shrimp isn't the easiest thing: these fragile shrimp can be a little difficult to get to reproduce. If the water parameters are in order and your shrimp are well-fed and healthy females should start carrying eggs soon. These hatch into tiny versions of the adults after around 30 days. Make sure there is plenty of biofilm available for the fry to feed on until they're large enough to forage alongside the adults. Not all fry will come out looking like the parents: you will have to select the best ones yourself. You can keep breeding them or sell them for a nice profit. If you're up for the challenge, you can also try breeding your own blue bolt shrimp from different bee shrimp varieties. You can read a little more about that here. Blue bolt shrimp are not a very common shrimp variety to be found in aquarium stores. Because they are so uncommon they are also not the cheapest shrimp out there, but more than worth it if you're looking for a real eyecatcher. If you're interested in starting your own colony you might be able to get your shrimp from a fellow hobbyist or you can buy online. The Shrimp Farm sells blue bolt shrimp with live arrival guarantee and ships them right to your doorstep. You can buy your shrimp here! 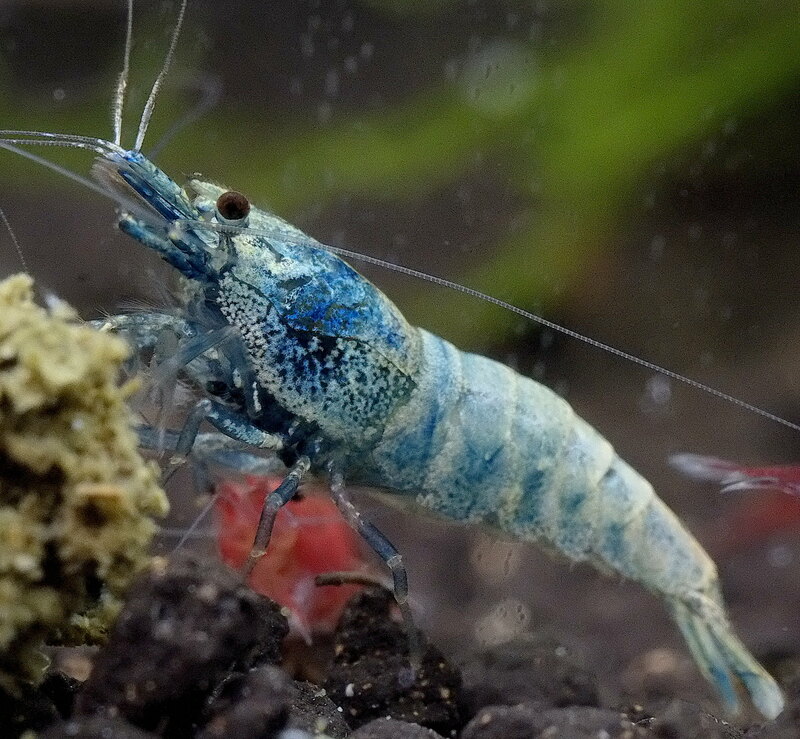 If the challenge of keeping and breeding blue bolt shrimp is a little too much for you, there are various other blue shrimp varieties to choose from. Blue velvet shrimp, for example, are a lot more beginner-proof and still have a lovely blue color.